“WHAAAAAAAT? !” I cant help but laugh every time i think about Ralphie’s friends mother, from the Christmas Story, in that scene on the phone, where Ralphie’s mom called the mother of his friend – the one who had supposedly taught Ralphie the dreaded “f” word. Well, that’s exactly how I feel whenever I think about Thanksgiving being tomorrow and Christmas fast closing in! WHAAAAAAT?!?!?! Man, I have been so busy recuperating from being sick the last 2 weeks and taking care of my kids (who were also sick) & working that I haven’t really had time to do much else. We all caught an awful respiratory/sinus infection. Oh I wouldn’t wish it on anyone. It took days to get better!! I had to skip work for 3 days, which is a big deal this time of year in retail! Now I remember why I had the rule to always eat a raw clove of garlic every day! It works! Do it! I have been looking forward to this Thanksgiving since last Thanksgiving. I just love watching my family devour delicious vegan food. My super-mom takes on the task of making food for all 20 of us – the majority of which are vegan and gluten-free (the dishes, not the folks)- which is no easy feat. Thanks momma! When we gather as a large group, we have all kinds of eaters, including those of meat. SO, yes, I usually do have to sit at the table with a turkey, or sometimes 2 😦 I would love it to not have a turkey at the table, but I feel that Thanksgiving isn’t about judging each other or giving each other a hard time, nor is it the time to “lecture” one about eating meat, which only turns those people I am trying to reach farther away. The secret is this: I find that if you bring delicious vegan food to the table, it will impress even the most devout meat eaters and bring the vegan way to light in a positive way rather than a negative one. No one likes a preachy vegan and I try my damndest to not be one, no matter how passionate I am (and believe me, I am VERY passionate about veganism!). I also find that if you just serve food without making a huge fuss about it being vegan, more people try it. In fact, sometimes I think it is best if you don’t say anything about it being vegan. Then, after your guests are complimenting the terrific food, saying it is absolutely the best whatever-it-was that they ever had, THAT is the time to say “Yeah, it IS awesome huh?! And guess what… its 100% VEGAN!” I have literally seen eyes pop out of heads with that method. Despite being sick, I had some terrifically awesome news this week. I was invited to show my art at a popular restaurant that is opening a new location on Friday… Viva Argentina. I am so excited because I have been wanting to display my art for several years, and just haven’t found the time. Well, somehow, in the last 3 days, I have found time to make this happen! Needless to say, I have been running around like a Tasmanian devil ever since I was propositioned… working, framing, matting, and figuring things out! My blog kinda got put on the back-burner for the last 3 weeks due to these factors, which is a SHAME since Thanksgiving is the day after tomorrow. So, the least I could do was to share a few amazing links with you all! This one is Buzzfeeds 2013 Thanksgiving recipe compilation. It is full of great stuff! Also, Buzzfeeds 2012 list has even more great selections!! 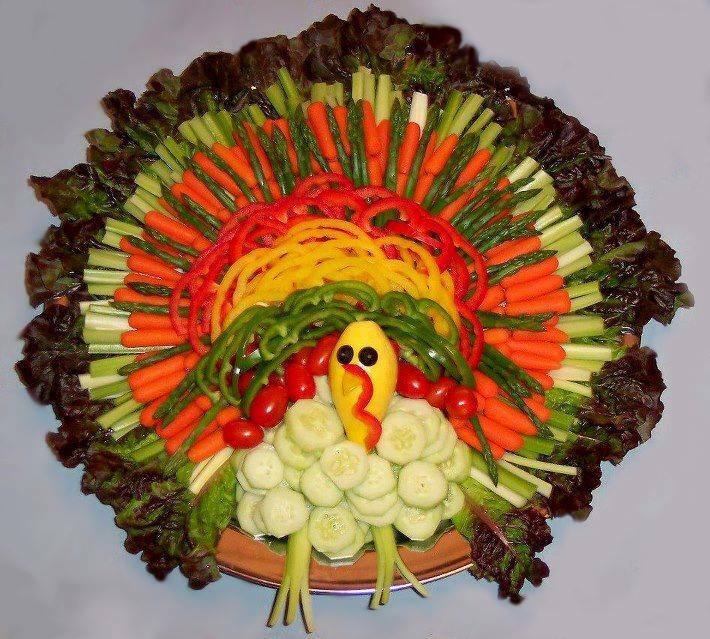 Don’t forget to scroll through my vegetable & holiday dishes! I make a mean pumpkin pie (without even using tofu! ), and my cauliflower-mashed potatoes, butternut squash soup and agave glazed carrots are also good choices for holiday dining! No matter what you are faced with this Thanksgiving, try to do one thing: remember to be grateful for the family you have, regardless of their food choices. If there is one thing I have learned, it is that being respectful (even if you don’t agree) brings people together and makes more open minds than closed ones. Some people are very defense about their right to eat meat. Some people will have a million and one reasons to argue with you. Don’t do it!! The best way to win an argument about veganism is to simply bring it to the table – the food, not the debate! In fact, I just found this awesome article about just that & other concerns you may have on the Vegetarian Institutes Site. Now go rest up and have yourself a holiday chocolate peppermint martini!! Christmas is only 28 days away!! Happy Thanksgiving! As long as I can remember, I have enjoyed creating food. Before I was old enough to be in the kitchen alone, I was outside letting my mud cookies “bake” on a wooden board out in the sun. When I realized that I could tie my passion for animals and baking together, my heart almost exploded. I truly love it when someone is wowed by something i made, or surprised that vegan food “can actually be good”! (Geez, its mind-blowing and sad to me how disconnected some of us are from eating real homemade foods with no preservatives!) I love showing people that you don’t need to use dairy/eggs in baking. I love teaching others what I like to call “compassionate cooking”! Okay, I know… I really need better pictures of these – You’ll have to forgive me. I was in a rush – to eat them. I will take better pictures next time, which will be soon! Hey, I never claimed to be a photographer, I’m just your vegan neighbor who likes to make yummy food! This recipe is more or less straight from Isa Chandra Moskowitz’s book “Vegan Brunch”, which may be my favorite of her’s. I actually own all her books except the pie one, which will be on my Xmas wish list! Chef Isa might slap me if she knew I used lemon juice from a jar instead of fresh lemon juice, but sometimes when you get a craving, you Tim Gunn it… and by that, i mean, you “MAKE IT WORK”. So, Isa’s original recipe contains fresh lemon juice and also 2 Tbsp lemon zest. Next time I’ll make Isa proud, but this time, it was still good enough to where my daughter said “Can i have another cupcake?” when it was gone! Now that’s a good muffin! 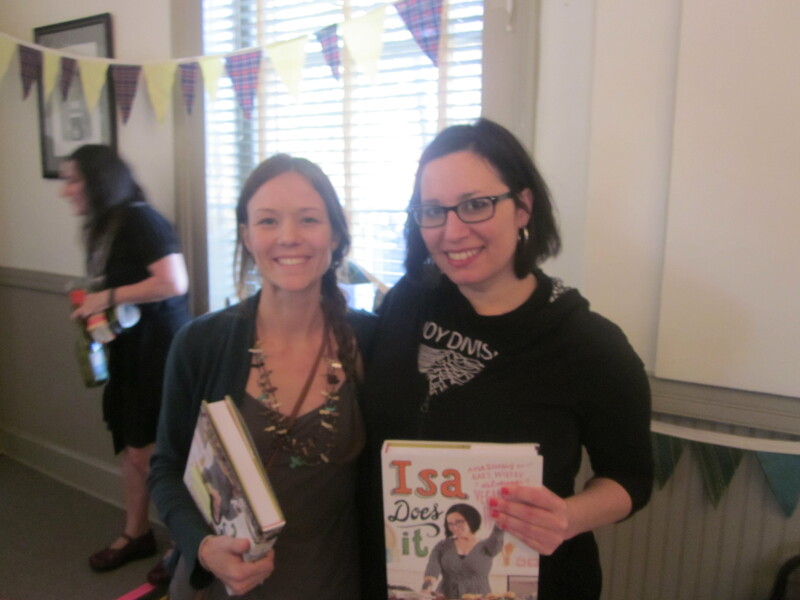 Me & Isa – Too bad the guy in line behind me was a terrible photographer! It’s a little fuzzy and the light is terrible, but I’m just glad I got a picture! I didn’t want to take up anymore of her time asking for a re-do! 1) Preheat oven to 375. Lightly grease a muffin tin or line with paper cups. 2) In a large bowl, mix flour, sugar, baking powder, poppy seeds and salt. 3) Mix liquids in a small bowl separately. Make a well in the center and add the liquids. Mix gently until dry ingredients are moistened and no pockets of flour remain. It will look a little lumpy. 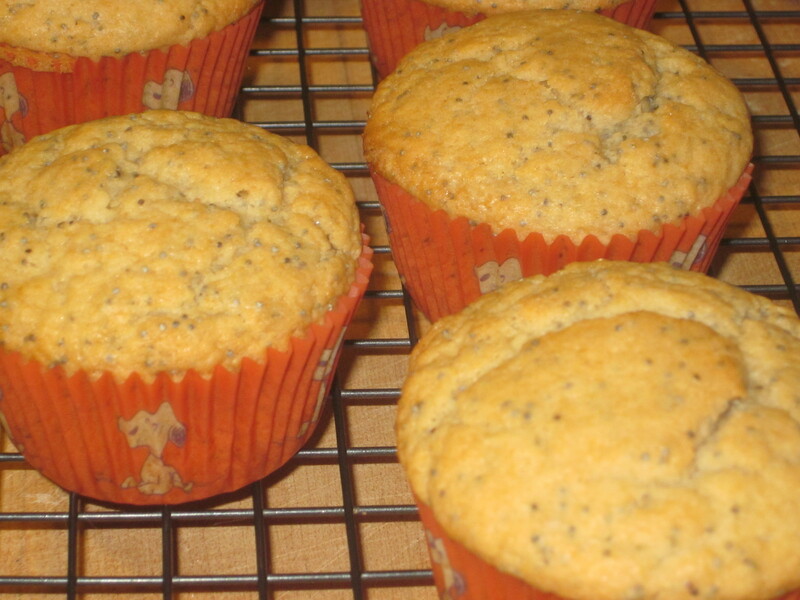 4) Fill muffin tins evenly and bake 23-27 minutes, until tops are lightly browned and a toothpick comes out clean. When cool enough to handle, move out of the tin onto a cooling rack. Devour!